As July slipped into August and Mitt Romney returned from a clunky, undiplomatic trip overseas, the Romney campaign unleashed a barrage of ads targeting Ohio--a drop-dead crucial swing state where President Obama is surprisingly buoyant, largely because of the perceived success of the auto bailout. The ads provide a glimpse at the main economic argument Romney hopes to make in the fall campaign, although Ohio is a particularly challenging place to test that message. Ohioans are feeling pretty good about their economy these days. Their unemployment rate, 7.2%, is below the national average. One of the ads, called "Time for a Change," presents the case in its most basic form: 41 months of unemployment above 8%, 473,000 jobs lost, median household income down $4,300. You can quibble with the details. The job losses came early in the Obama Administration and were caused by events that occurred before he arrived--the housing bubble, the Wall Street crash. But this is Romney's best argument: "Obama isn't working." Two other ads feature Ohio businessmen, and they are rather curious. There is an auto salesman named Al Zarzour, whose dealership was one of more than a thousand that were tagged for closure when General Motors reorganized itself after the bailout. It's a sad story, but a brazen one for Romney to tell, given his history of creative destruction. Essentially, he's criticizing the Obama Administration for the very practices that defined his successful career as a businessman. And he's swimming upstream: Ohio's Republican governor, John Kasich, recently told me that the bailout didn't create many new jobs in Ohio, but it saved a ton of them--not just in autos and auto parts but in ancillary industries like steel, plastics and consumer goods. Most people in Ohio seem to understand this. 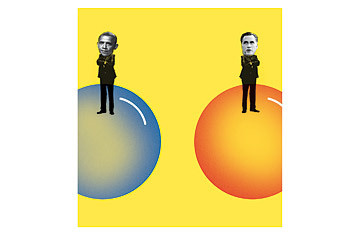 I suspect Romney won't have much luck changing their minds. The third ad, and the most effective, stars Dennis Sollmann, who owns an electrical-construction company. It begins with some embarrassing, if heavily edited, sound bites from Obama's famous "You didn't build that" speech. "If you've been successful, you didn't get there on your own," the President says, adding that he's "struck" by successful people who say "It must be because I was just so smart. There are a lot of smart people out there. It must be because I worked harder." And then, after some editing, "If you've got a business, you didn't build that." Enter Sollmann, with a chuckle: "I mean, I'm thinking, You've got to be kidding me. He was trying to say, 'Hey, you didn't build that business on your own. The government helped you build it.' And that's what ticked me off more than anything."